Field House Farm is happy to announce the schedule for three week long sessions of our Summer Agriculture Program for Children. The program will introduce kids to basic farming practices, allowing them to plant and harvest in our large garden and greenhouse. We will learn about what grows in Connecticut and what all of us can do with just a small amount of space, or even containers! Kids will leave with the skills to grow some of their own veggies to share with their families! Kids will also learn about the animals that we have on our farm, including chickens, ducks, turkeys, donkey, pigs, sheep, goats, and cows. We will discuss the care of these animals and the kids will be allowed to participate in their care….and their play! Additionally, each day will allow time for either a nature themed Art class, an Earth and food science class, or nature crafts with specialized teachers. All morning sessions are open to children from the age of 5-12 years old. Afternoon sessions are open to children ages 8-12 year old. The morning session will start at 9am and end at 1pm. A healthy snack and drink will be provided in the morning. There is a lunch bunch option (bring your own) from 1-1:30PM. There is a special offering of an afternoon session for 8-12 year olds. Your child can enroll in this separately or in conjunction with the morning session. This will run from 1:30-3:30. The afternoon sessions will include more hands on farm work, animal husbandry, and crafts. There will be specialized teachers for wool crafts, and many other exciting topics. Please complete the online registration form below. Please note: There is a nonrefundable 20% fee for any canceled camp reservations. Camps are subject to cancellation due to low enrollment. If this is foreseen, notification and refund will be given at least two weeks prior to start of camp. Please note that we can not administer any medications to your child while they are in the program. If your child has a medication that is needed, it is the parent’s/guardian’s responsibility to administer it prior to or after the program. I give my permission for my child to participate in the Field House Farm, LLC Agriculture Program. 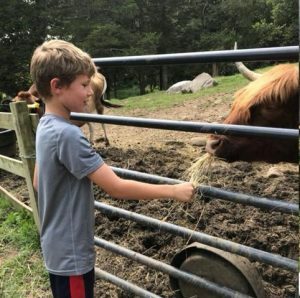 I understand that my child will be working near and with farm animals and will be under direct adult supervision at all times. In the event of an emergency, my contact information has been listed below. If I am unable to be reached, I consent to Field House Farm, LLC calling 911 to assist my child as needed. I recognize that there is inherent risk while working with animals and have discussed appropriate behavior with my child. Field House Farm, LLC will maintain supervision of all children while on the farm. In consideration of my fee for participation being accepted, on behalf of my child, I, myself, my heirs, executors, administrators or anyone else who might claim on my child’s behalf, covenant not to sue, and waive, re-lease, indemnify, hold harmless, and discharge Field House Farm, LLC, its landlord, its member, agents, employees, volunteers, assigns or anyone acting for or on their behalf, from any and all claims or liability for death, personal injury, or property damage of any kind or nature arising out of, or in the course of, my child’s participation in this event. This release and waiver extends to all claims of every kind or nature whatsoever, foreseen or unforeseen, known or unknown.